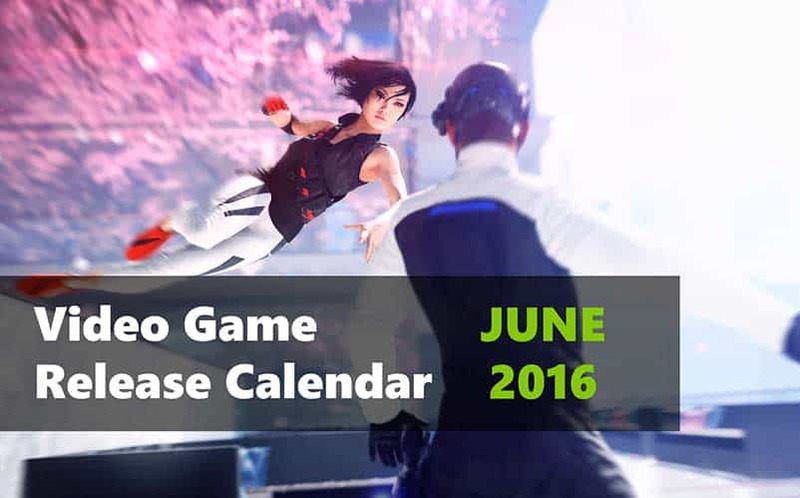 WATCH: Video Game Release Calendar: June 2016 | Nerd Much? We’ve seen some incredible games in 2016 so far, and we’re coming up on the middle of the year soon. And not only does that mean E3 2016 (which, by the way, is in less than a month), but it also means some great new games to play in June. With that in mind, we here at Nerd Much have decided to begin releasing our own video game release date calendar every month, starting with June 2016, mostly because we severely miss the GT release calendar every month. Anyway, this month will see the release of one of the year’s biggest releases, Mirror’s Edge Catalyst, as well as some other upcoming games we are looking forward to, such as Sherlock Holmes: The Devil’s Daughter, Tokyo Mirage Sessions #FE, and Zero Escape 3: Zero Time Dilemma. Whether you’re looking for new Xbox One games, PS4 or PC games, or something new to play on the 3DS or Wii U, June has a wide variety of new games that we’ll surely be delving into (if we can pry ourselves away from Overwatch, that is). So, if you want to know what games you’ll be feasting on in June, see our very first Video Game Release Calendar, and see the list below. You can also now check out the upcoming games of July 2016 as well.